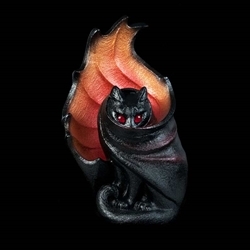 The outside of this dramatic Grimalkin Candle Lamp is painted black to contrast with the fiery metallic copper and gold that surround the inner votive glass and candle. When lit, light from the votive candle shines through her red glass eyes. For indoor use only. Glass votive included.